Chilling in the museum gallery. At the moment, there is an exhibition of a wildlife photographer’s work near the Alcázar. Julia and I went to take a peek. The collection is titled “A Zebra in My Bed.” Though there were no beds to be found in her pictures, there were lots of incredible nature shots. The exhibit is organized around 6 high-def TV screens set to slide-shows of the photos. Each TV screen represent a a “theme” of wildlife that the photographer focused on: Intelligence-looks, love-maternity, beauty-black and white, connection-pairs, fascination-birds and power-action and the photographs were grouped accordingly. It was impressive! 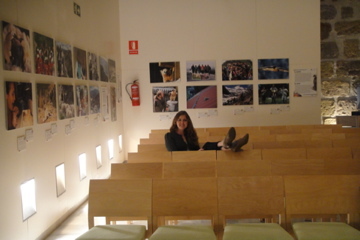 Here is a link that shows just a few of her photos: http://www.elcorreoweb.es/agendadesevilla/106186/exposicion/cebra/cama/marina/cano/foro/biodiversidad. That night, we also attended the European Film Festival that’s been in Sevilla for the past week with one of our neighbors. We saw a film which was an hour and a half of interviews with a 91-year old Spanish woman! It was certainly a linguistic challenge for Julia and I. On Saturday, a friend from our program was in town, and so went to lunch…around 3pm of course! 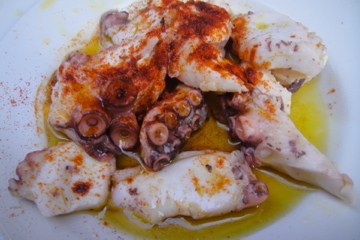 Julia was brave enough to order the pulpo (translation=octopus) a la gallega, which involves a drenching of olive oil and a showering of sweet paprika. The dish was a bit intimidating, especially without the cooked potatoes that sometimes accompany the octopus. Needless to say, there were a couple of tentacles left on the plate when we left. Perhaps it’s an acquired taste! We found a church in an outer neighborhood of Sevilla (Protestant churches are few and far between here in predominately Catholic Spain), and it’s a bit of a public transportation adventure to get there for Sunday morning services (not that Julia and I have any lack of experience on public transpo thanks to our commutes!). 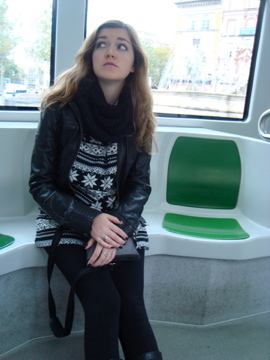 Here’s a pic Julia snapped of me on the tram outside of our apartment. 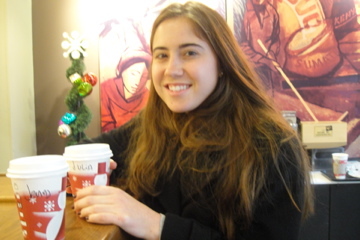 Julia at the Starbucks across from our apartment. No peppermint mochas and eggnog lattes here- Starbucks decided that toffee nut lattes and praline mochas are more to the Spanish taste. 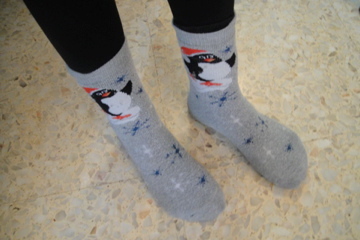 Have a jolly pre-holiday day!